Even if you haven’t succumbed to the adult coloring book craze yourself, chances are you know someone who has. With coloring books for everyone from lawyers to X-Files lovers, it was only a matter of time before they made one for fans of wacky, retro patents. 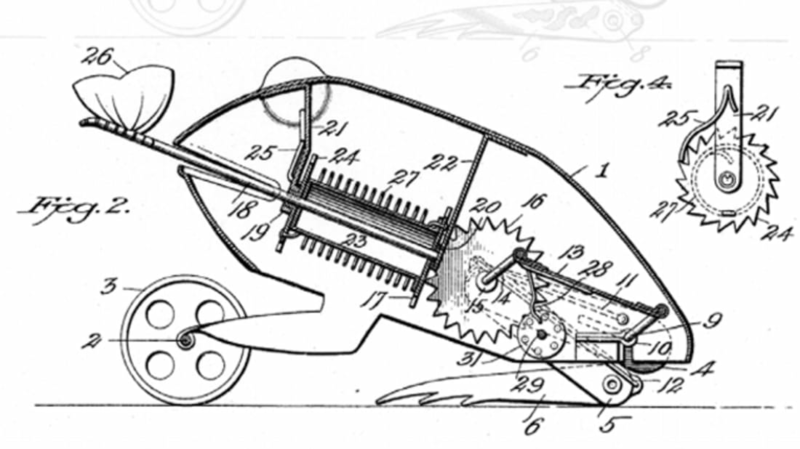 The National Archives of America recently released a free PDF of a coloring book depicting 16 favorite patents from their holdings. Most of the illustrations date back over a century, and they range from the practical (the actual troop lander used on D-Day) to the bizarre (protective goggles for your chickens). While many of the patents never seem to have made it off the ground, maybe this coloring book can be a chance to give them a second look. A mini hammock for trains that hooks onto the seat in front of you would be a perfect fit for movie theaters, and “sandwiched bread”—bread with chunks of meat baked inside—sounds like something today’s Americans would eat right up. After checking out some of the highlights below, you can download a free PDF of the coloring book here. Images courtesy of the National Archives.